If you can multiply then you can factor. Why? 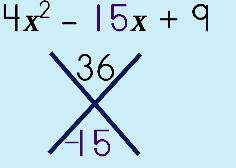 The skill involved in factoring is basically the skill you need to multiply because factoring is the opposite (a-ha! An inverse operation!) of multiplication. Being able to work through sum and product puzzles provide you the tools and skills needed to factor quadratics! Two different methods will be used: The first utilizes working backwards using the sum and product puzzles followed by the generic rectangle method to come up with the factors. The second method shows how to utilize working backwards from the FOIL method. Both are quite simple, truly. You can use the Box Method to help you factor quadratics (i.e., go backwards to find the polynomials). Cool beans! So, let's take a peek at how it's done. 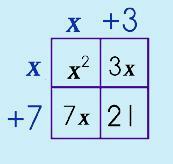 You know that this is going to factor to two binomials so start by making your 2x2 box. Fill in the top left box first. This will be your first term…your term with the highest exponential value. Here's the 'hardest' part (ha!). Find the factors of this last term (the number in the bottom right). What two factors, when you ADD them, will give you that middle term in your quadratic trinomial? Those two factors are the numbers you will use to finish your box. Special Note: IF you are familiar with the Sum & Product Puzzles/Problems, this is the time to utilize this particular skill. This is where this comes in handy! Now, all you have to do is take what is in the box and move the terms out! Begin in the TOP left…write down the square root of the term, one on top and one to the side. Look at the DIAGONALS…separate out the variables and simply write the coefficients, the one at the top goes up on top and the one along the side goes, well, along the side. Step 1: Make a Sum & Product Puzzle. Put ac at the top. Take coefficient a and multiply it with coefficient c.
Put ac in the top of your puzzle. Step 2: Put b in the bottom of the puzzle. Place coefficient b at the bottom of your puzzle. *The numbers that work as factors should also work as the addends. If you have forgotten how to do these types of problems, then go back to the Sum & Product page. Step 4: Make a Box (generic rectangle). Fill in term a and c.
Place the first and last term in the diagonals. Step 5: Place the Sum & Product numbers in the other two boxes. Take the two numbers you got from the Sum & Product Puzzle and put them in the two other boxes. 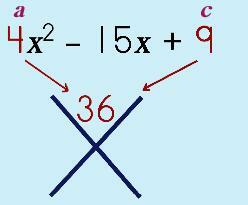 Include the variable x. Step 6: Move the factors OUT. Look at each box. Factor out the terms. In the first box, take the square root of the variable and move one x out. Take the coefficient and the variable and move it out. Look at one of the other boxes. How would you get this particular product? Write the factor above the box. Do the same for the other box. NOTE: I always double-check my math once I am done because you want to be sure that when you multiply, using the Box Method, that you have correctly factored everything! Basically, you are done. You have now factored your trinomial! Step 1: Set up the two sets of parentheses (-----)(-----) to come up with the FIRST term in each binomial. The first term in each binomial (each set of parentheses) will be the factors of the first term of your trinomial, in this case 3x2. How can you possible get the product 3x2 ? Step 2: Now, the goal is to find the products of the LAST term in the trinomial. The last term in each binomial (each set of parentheses) will be the factors of the first term of your trinomial, in this case 2. Step 3: Consider the MIDDLE term in your trinomial. The middle term in your trinomial MUST be considered because it is going to determine which of the pairs of factors you are going to use for the binomials! What do I mean by this? Consider the combinations using the FOIL method (first, outside, inside, last). When using FOIL, you multiply the outside and inside terms together and combine them to get the middle term in your trinomial, right? So, let's try this out with each possible combination for the factors of 2. Is it possible to produce 7x by combining the outside and inside terms? With the first example, (3x • 2)(x • 1), it just didn't work. So, dump THAT combination. Try the second example, (3x • 1)(x • 2). Yep, it works! The outside (3x • 2) = 6x and the inside (1 • x) = 1x and when you combine (add) the two terms (6x + 1x ), you get 7x. Voila! This means we now have the binomials we wanted, OR, we have now factored our trinomial.